With the VetShopAustralia.com.au Surfing Dog Spectacular set to kick off in less than a week, it inspired some research into what other animals also like to hit the waves. 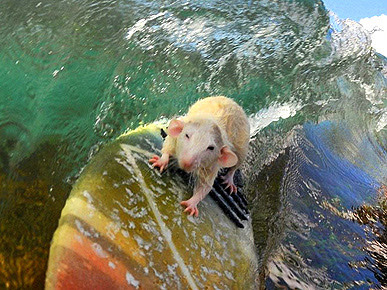 It seems there are plenty of furry friends other than dogs who are regular surf stars, take a look for yourself! 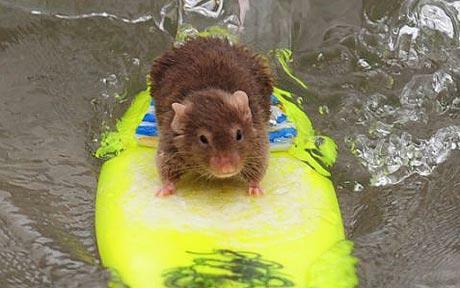 Surfing mice are the latest critters to hit the surfing world headlines. Their owner made them each a tiny hand crafted surfboard and pushed them into some little waves- the rest is history. Check out the YouTube surfing mice video. Running on a wheel isn't apparently not enough for this thrill seeking rat. Tofu likes to go surfing for a more extreme rush! Meet the surfing goat that has become an internet hit since she began carving up the waves. Two-year-old Goatee can ride the waves with her fellow human surfers on Pismo Beach, California. Goatee's owner, Dana MacGregor, trained her to stand on a surf board. A Peruvian surfer has actually taught his pet alpaca called Pisco to ride a surfboard. Pisco's owner even makes sure the alpaca has cotton in his ears before entering the water. 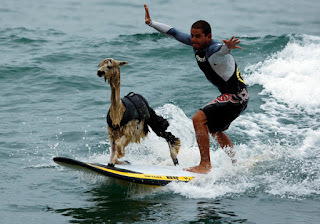 For an extremely unusual sight take a look at the surfing alpaca YouTube clip. Little Nicolasa, a four month old, tortoiseshell kitten from Lima in Peru is the latest sporting phenomena according to world news stations. She is a “surfing cat” and according to her owner she actually started to get into the water by herself for a cooling swim before giving surfing a try. 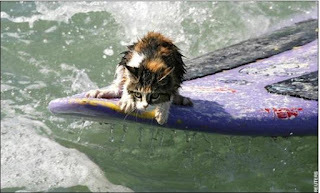 Check out the surfing cat YouTube video. Believe it or not, footage of a surfing duck has emerged and it looks like this duck is loving every minute of it! Check out the surfing duck video on YouTube for a glimpse of the super surf duck in action. They say pigs can fly but it seems these clever creatures can also surf! 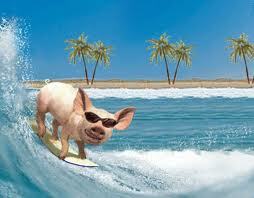 One pig in particular has made a name for itself in Hawaii by regularly taking to the waves for some surfing action. See for yourself on the pig surfing YouTube Video. Meet Mildred the incredible surfer sheep!The six-year-old woolly ewe has become an internet hit with more than 50,000 clicking on to watch her take to the sea on a beach near St. Agnes, Cornwall. See the footage for yourself of the surfing sheep on YouTube.